Bing Ads Sitelink Extensions are additional links you can include in your ads that take customers directly to specific pages on your website. These extra links let you promote distinct products, services or sections of your site and leads searchers to the right information they need to learn more and take action. Help customers find exactly what they're looking for. Boost your click traffic — it’s that simple. Our testing shows that Sitelink Extensions can increase click-through rates by up to 30% for advertisers. Enabling enhanced site extensions is free and can easily be activated across multiple campaigns. With new enhancements to Bing Ads Sitelinks, you can boost your ad size by adding two lines of customisable, descriptive text to each sitelink. A larger, informative ad means more attention from users. 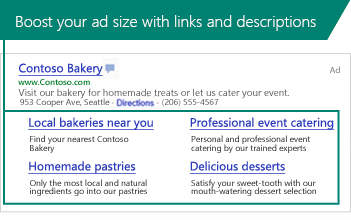 Bing Ads Sitelink Extensions are free to activate and include in your ads. The cost per click is the same as clicks on an ad title or URL. Read how to enable Sitelink Extensions for easy instructions, then sign in to turn on these links across your campaigns. Want more enhanced sitelinks? Let customers call you directly from your ad with Call Extensions, and add Location Extensions to help customers easily find your business.